Here's a new game from Microgaming, it's a superb exploration themed slot game with some superb bonus features. Christopher Columbus was a well-known explorer who discovered far off lands like America on his trusty vessel, the Santa Maria. If you want to emulate your travelling hero, then play our online slot casino like Age of Discovery today and unearth the mystery of the seven seas. As the first true online casino, Microgaming began their career at the top of the food chain in 1994. Over their 2-decade reign, Microgaming has turned out over 850 unique games, ensuring there is a game for everyone within their extensive collection. Consistently making headlines from their PayItForward scheme, this developer also holds a Guinness Book world record for the largest payout when one player chased a progressive slot with a 25p stake turning it into a staggering £13.2 million jackpot. If you love to play, check these amazing slots games out from Microgaming. The age of Discovery, a time when travellers such as Christopher Columbus would set out on never-ending expeditions relying on nothing but the stars and a lot of luck to guide their way. These happy accidents led to the exploration of new land and shaped the world as we know it. Now it’s your turn, what will you discover? While travelling across the 7 seas players are bound to come across several symbols, some of these lower valued symbols include traditional poker icons, but the much more sought after symbols come in the form of trade-worthy goods, items such as crops, textiles, rare stones and pots as well as some sailing staples such as compasses and cannons. To begin winning cash prizes players must aim to find at least 3 of any 1 symbol consecutively on a single pay line. 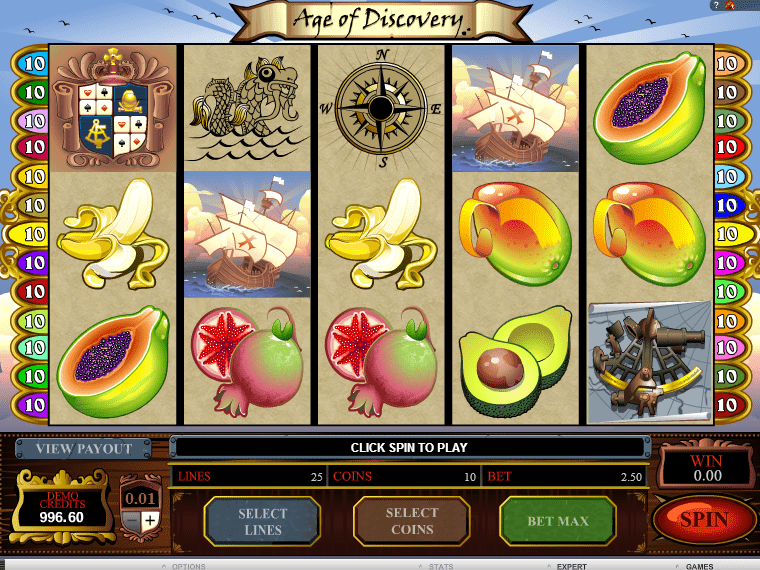 Age of Discovery contains 5-reels and 20 available paylines, when players win the machine will highlight the combination, displaying on the screen the number of coins to be added to the payout prize. The payouts available are directly linked to the amount wagered as wins’ work as multipliers. The higher the risk the higher the reward, the stake played can be adjusted at any time between spins by using the interface below the reel. From this, the credit, bet per line and line amount can all be set to suit each player and their individual playing style. One of the in-game bonuses is launched by a set of Scatter symbols (the Dragon), by landing 3 or more of these anywhere on the reel a Free Spin round will be triggered. The amount of Free Spins awarded are directly related to the amount of on-screen scatters, more Free Spins can be added to the final amount during the bonus round by simply landing more of the dragon symbols. But the bonus does not end at a round of no wager spins, each winning spin will also receive an additional multiplier, giving players even more bang for their buck. Keeping your time on the waves truly Wild the Golden Coin symbol can act as a replacement for any other none bonus symbols. This drastically heightens a player’s chance at a winning combination anytime the Wild appears. The final and most iconic bonus round comes from an additional bonus, by locating 3 compasses anywhere on the reel players will be transported to a mini-game. In the style of an upgraded minesweeper, you must select the crossed locations – many of them will result in a monetary award which will be built up until the end of the round. If you uncover a skull and crossbones the round will end, sending you back to the base game with winnings in hand. The exploration of the new world and online casinos both rely on lady luck. Based on the adventures of Christopher Columbus, players will sail across the ocean in search for new land and valuable trading materials. The gaming concept and story line is well thought out and this carries on seamlessly to the bonus round. Allowing players to take a break from spinning reels, the treasure searching mini game is a quick and effective way for players to amount a sizeable cash payout – this round has an even greater appeal because unlike many similar, finding the end round symbol will still allow players to keep their cash rather than having them play a continuous game of risk.